Ok so I went out for dinner last night with the girls for a Thai for a late celebration of two birthdays. My blog of late seems to be just turning into a “what I wore when” post which isn’t really what I wanted, mostly as I’m turning out looking real short in the pics… So I will try harder to rave on about other designers and things of interest, rather than just focus on lil old me…but for now here’s what I wore…. 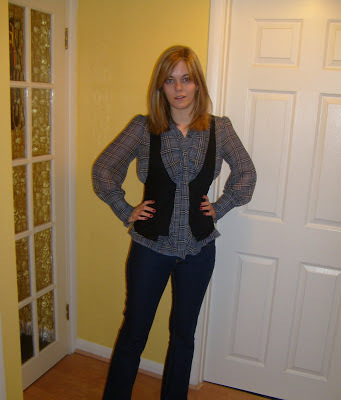 I struggle to find jeans that fit I seem to be an akward size…although I find Topshop jeans to be the best, they don’t reshape in the wash…these are kick flares and are really flattering. They balance out my extremely long body against my short legs and shapely hips and thighs. Gorgeous look! Especially the waistcoat! how’s this for a quick reply to your comment? Course I shall swap links with you, I’ll add you as soon as I’ve finished this comment! I did indeed make all the necklaces, the unicorn is up for sale and available if you wanted it, drop me an e-mail if you have any questions. Great blog, and that shirt is lovely. I love that vest so much! You look great. And yes, I’d be happy to link you! Your vest is absolutely gorgeous !! Of course, I added you on both of my Lists. I love the plaid under this–very chic!